Elegant fashion collection genuine Lite Grey pearl dangling from glittering rhinestones accented surgical post earrings. Wedding gift a divine pair of Lite Grey Pearl & shimmering rhinestones will be the perfect finish to any formal & refined their modern styling. 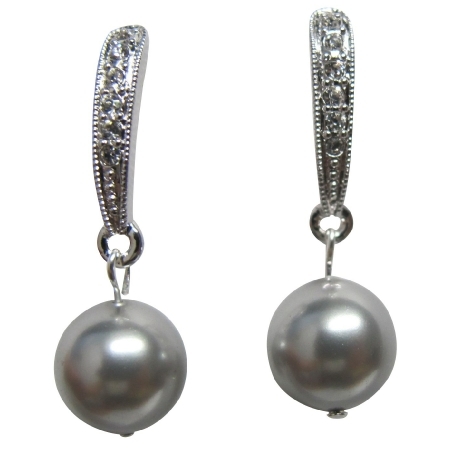 Material Used : 10mm Lite Grey Pearl drop from rhinestones surgical post earrings. Buy Wedding Earrings Grey Pearl with Diamante Dangling, sold & shipped by Fashion Jewelry For Everyone where you can shop online for Leading Online Retailer for Indian Fashion Jewelry. This Earrings collection has been tagged as Wedding Earrings,Earrings Pearls,Grey Earrings,Grey Pearls,Pearls Earrings,Diamante Earrings,Dangling Earrings,Wedding,Earrings,Grey,Pearls,Diamante,Dangling,Wedding Pearls Earrings,Grey Pearls Earrings,Pearls.